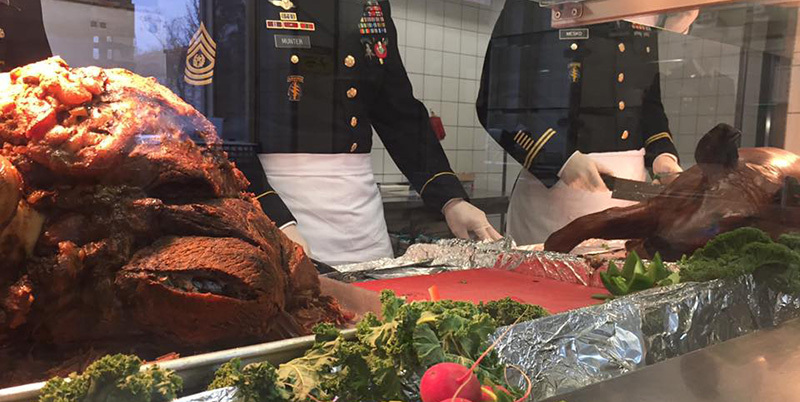 GRAFENWOEHR, Germany — Dining facilities at Tower Barracks, Rose Barracks and Camp Normandy are offering Thanksgiving meals Thu, Nov. 22. The Ever Vigilant Café will host a “Back to the Future” themed Thanksgiving feast Nov 22. The dining facility is open to all service members and community members. The Warrior DFAC on Rose Barracks will host a “Game of Thrones” themed Thanksgiving feast Nov 22. The holiday meal will also serve as the grand opening of the new Striker Inn dining facility, located in on Rose Barracks, Bldg. 612. The dining facility is open to all service members and community members. The Command Sgt. Maj. Lawrence T. Hickey dining facility (Camp Normandy) will host a traditional Thanksgiving feast Nov 22. The Command Sgt. Maj. Hickey dining facility is open to all service members.